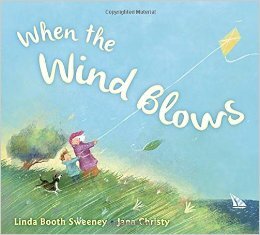 This picture book focuses on the many effects of wind, as told by a young boy as he explores and interacts with those affects with his mom and family. The way it is written, simple two-word sentences, noun-verb combinations, really enhances the flowing visual to capture “wind”. I also really love how the book focuses on these explorations and interactions through the relationship of a boy and his mother. *Note: This book would make a great lead into students writting their own stories/descriptions. Relationship between a mom and her son and the adventures they have interacting and observing wind. There is also aspects of family exploration, but the focus is more on this one relationship. There are also connections to feeling wind, rather than just observing wind.